The Intel SSD 750, the Samsung 950 Pro and the OCZ RD400 were all reviewed with the NVMe drivers supplied by the SSD vendors. In the past, vendors have sometimes cited performance as an advantage to using their NVMe driver over the one built in to Windows, but the primary reason has been that Microsoft's driver implements a limited feature set. The driver that was made available as an update to add NVMe support to Windows 7 SP1 and Windows Server 2008 SP1 did not include the necessary interfaces for updating SSD firmware, and even on Windows 8.1 and later the vendor-specific management tools require their own driver for performing tasks like a secure erase. Samsung's NVMe driver for the 960 Pro was not ready in time for this review. They are planning to release it in mid-November in conjunction with their Magician 5.0 utility. The Samsung NVMe driver will be required to support Magician 5.0's new "Magic Vault" secure archive/backup feature and the new secure file erase feature. In the meantime, rather than try to hack Samsung's NVMe driver for the 950 Pro to work with the 960 Pro, this review is relying on Microsoft's NVMe driver built-in to Windows 8.1. While most SSD vendors (especially the smaller ones) now say that Microsoft's NVMe driver offers adequate performance and that there is no need for a custom driver to get full performance, there are some pitfalls. 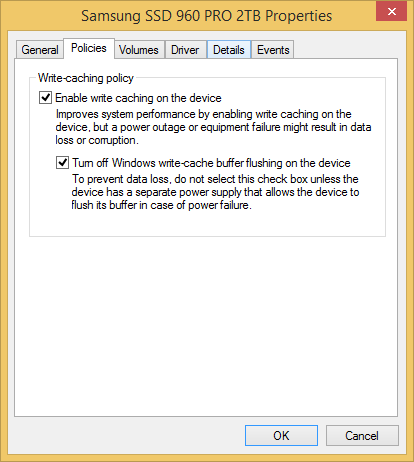 Windows provides two settings for drive write caching policy. By default, write caching is enabled on internal drives and there is an unselected option to turn off write cache buffer flushing. Both options have warnings attached about the possibility of data loss in the event of a power failure. It is normal for SSDs to cache and combine writes rather than immediately send all written data straight to the flash, and this is necessary to overcome the fact that NAND flash write operations are inherently much slower than read operations. Without write caching on the SSD, we would never see good random write performance, let alone random write performance that exceeds random read performance. The default write caching policy settings work fine for SATA SSDs. This is not the case for NVMe SSDs when using Microsoft's driver. Microsoft's NVMe driver in the default configuration is extremely conservative about write caching, leading to extremely poor performance on some tests. Checking the second box gives performance that is as expected while leaving it unchecked for a high-end NVMe drive can lead to worse performance than a low-end SATA drive. Normally I would not review a drive with an obscure setting like this changed, especially since it can increase the risk of data loss, but Microsoft's default is clearly broken and not in line with the industry standard practices. The 960 Pro was benchmarked with the settings as shown above, and a more thorough comparison of how NVMe drivers and operating system versions affect performance will be coming in the future. When evaluating graphics cards a MINIMUM frame rate is WAY more important than average or maximum. Just like in racing the slowest speed in the corner is what separates great cars from average. Exactly. Intel 750 is still the king for someone who seriously needs storage performance. 4K randoms and zero throttling. Exactly, when majority ( 90%+ ) of consumer usage is going to be based on QD1. Giving me QD32 numbers is like a Mpixel or Mhz race. I used to think we reached the limit of Random read write performance. Turns out we haven't actually improved Random Read Write QD1 much, hence it is likely still the bottleneck. Nice to see there are still some folks out there who arent duped by marketing, random write and full capacity consistency are the only 2 things a look at. When moving large video files around sequential speeds can help, but difference between 500 and 1000 mb/s isnt much, you start the copy then go do something else. In many cases random write is the bottleneck for the times you are waiting on the computer to "do something", and dictates if the computer feels "snappy". Likewise, performance loss when a drive is getting full also makes you 'notice' things are slowing down. Let me do a BIG WARNING against disabling write-buffer flushing. Any drive without special provisions for power loss (eg: supercapacitor), can really lose much data in the event of a unexpected power loss. In the worst scenario, entire filesystem loss can happen. 1) "enable write cache on the device" enables the controller's private DRAM writeback cache and it is *required* for good performance on SSD drives. The reason exactly the one cited on the article: for good performance, flash memory requires batched writes. For example, with DRAM cache disabled I recorded write speed of 5 MB/s on a otherwise fast Crucial M550 256 GB. With DRAM cache enabled, the very same disk almost saturated the SATA link (> 400 MB/s). 2) "turn off write-cache buffer flushing on the device": this option should be absolutely NOT enabled on consumer, non-power-protected disks. With this option enabled, Windows will *not* force a full cache flush even on critical tasks (eg: update of NTFS metadata). This can have catastrophic consequence if power is loss at the wrong moment. I am not speaking about "simple", limited data loss, but entire filesystem corruption. The key reason for such a catastrophic behavior is that cache-flush command are not only used for store critical data, but for properly order their writeout also. In other words, with cache flushing disabled, key filesystem metadata can be written out of order. If power is lost during a incomplete, badly-reordered metadata writes, all sort of problems can happen. This option exists for one, and only one, case: when your system has a power-loss-protected array/drives, you trust your battery/capacitor AND your RAID card/drive behave poorly when flushing is enabled. However, basically all modern RAID controllers automatically ignores cache flushes when the battery/capacitor are healthy, negating the needing to disable cache flushes software-side.